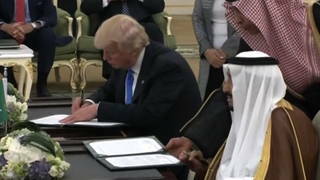 U.S. Sells New Warships to Saudi Arabia Despite Warnings of War Crimes & Civilian Deaths in Yemen | Democracy Now! JUAN GONZÁLEZ: And before we end, I’d like to ask—switch topics and ask Congressman Lieu about another subject, about the Saudi-led war in Yemen. The Obama administration has just approved an $11.25 billion deal to sell four advanced, Lockheed Martin-made warships to Saudi Arabia. The move comes as Amnesty International has called on the United States to halt arms transfers to Saudi Arabia or risk being complicit in war crimes in Yemen, where the Saudis are waging a U.S.-backed campaign against Houthi rebels. Congressman Lieu, you recently co-wrote a letter to President Obama about Yemen. REP. TED LIEU: I wrote a letter, and then I co-signed a second letter, because the Saudi Arabia-led coalition are conducting airstrikes that are killing civilians. There has been repeated instances of bombs dropping on civilian targets nowhere near military targets. Thousands of civilians have died, and I want to know why that is happening and why is the U.S. assisting this coalition and not stopping these attacks from happening on civilians. AMY GOODMAN: And what you feel should happen in Syria, Congressmember Lieu? REP. TED LIEU: I think we need a strategy. I would like to know what the end state is that the administration wants to achieve. Until they present that to Congress and the America people, I do not believe the U.S. should be bombing in Syria. I believe we need to take our limited resources and really help the refugees that are fleeing Syria and help deal with that tremendous humanitarian crisis. AMY GOODMAN: Well, I want to thank you both for being with us, Congressmember Ted Lieu, Democratic congressman from Los Angeles, and Bill McKibben, co-founder of 350.org. Bill, we’ll link to your piece in The Nation, and we’ll also link to these two series, these stunning exposés in both the Los Angeles Times as well as InsideClimate News. This is Democracy Now!, democracynow.org, and that’s where we’ll link to these articles. When we come back, The Prize. What happened to the $100 million that Mark Zuckerberg gave to Newark, New Jersey, schools? Did the kids profit? Where did the money go? Stay with us.